The Vitamix blender of early 70s was the first consumer blender that featured a big and powerful electric motor with a special blade design that was capable of mixing and grinding that was unheard of before in a regular blender. Vitamix revolutionized the blender industry, and they have never looked back. The all new Vitamix G-Series 780 Black Home Blender with Touchscreen Control Panel takes the brand to the next level and that’s why there’s a lot of buzz surrounding it. While all previous models feature manual controls like dial knobs and switches, the Vitamix 780 comes with a glossy black all glass touchscreen panel. This means a few benefits, which we’ll get to later on in this review, but before we go any further, you should know that this is now the most expensive Vitamix for home use available now. Is it worth the extra money? That’s what we’re going to find out. Before this model was released we listed 5 different Vitamix models that we thought were the best picks for home use and we explained why. If you think that the new 780 is not affordable to you, check those out instead. The 750 model comes closest to this one, except that the 780 has a touchscreen panel, is easier to clean and is a touch quieter. There are a couple of online stores that you can buy the Vitamix 780 from. One is Amazon and another is Sur La Table. 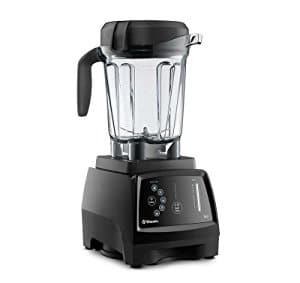 Most blenders were rated by wattage, but Vitamix blenders are rated by horsepower and amperage. The 2.2 horsepower 12 amp Vitamix 780 is a beast and has 4 inch diameter sharp laser-cut stainless-steel blades for crushing and cutting, which makes it capable of actually making nut butters and kneading dough. Try that with a run of the mill blender, and you’ll burn it out. But not a Vitamix. It was made for that kind of abuse, and it will take all that you can give, and then some. When it comes to making smoothies, you will not find even a hint of graininess is the final drink. Veggie smoothies won’t have bits of leafy greens show through and berry smoothies won’t have any trace of seeds left. The high speed friction blending will cook raw veggies as it blends to make hot soup in a jiffy. The 780 is a Next Generation low profile blender that comes with a full 64 ounce capacity pitcher, which can hold a full 2 liters worth of smoothies. The base has no buttons or dials, just a hardened glass touch screen to activate the many functions. This base is compatible with all the other Vitamix jars, so for example, if you already have a 32 ounce dry jar from an older model you can use that with this model too. We recommended buying the dry jar if you don’t have one because that means you can grind grains to make things like bread from scratch. Once you’ve ground the grains you can switch to the 64 ounce wet jar to make bread dough. You won’t even need to knead the dough this way! The smaller jar is also best for blending smaller portions, salad dressings and sauces. The base may seem a bit spartan compared to some, but the basic functions like pulse and 5 presets for smoothies, hot soup, purees, frozen dessert and even a self cleaning setting are provided as well. Just tap the icon on the screen, and go. You also get a responsive speed adjustment control that you can change by either tapping next to a speed number or by sliding a finger up and down. It will work just as well even if your finger is wet, oily or sticky! Each selection lights up through the LED screen. A start and stop touch button is right in the middle and the manual on and off safety switch is on the right side. Another remarkable feature of the Vitamix 780 blender is the fact that you’ll rarely have to use the included tamper because the force from the blades pull down and creates a very effective vortex that sweeps up all the ingredients. If things like nut butters require the use of the tamper, you can use it without stopping the run because it has a collar that allows you to insert it through the opening on the lid without letting drop down onto the blades. The power cord is 6 feet long so you can set the blender almost anywhere to use it. It stores away neatly underneath the base in its own spool and it’s easy to wind and unwind it as necessary. When you’re done using the blender, cleanup is the easiest of all the other models because of the absence of switches and dials. Just wipe the panel clean with a damp sponge or cloth. To clean the pitcher, fill it halfway up with water and a couple drops of dishwashing liquid and let it run on the “cleaning” preset for about 60 seconds. With so much power, this blender can become a food processor, a stand mixer, an amazing smoothie maker and it will even clean itself. Easy to use touch screen with well marked settings. Tough stainless steel blades that will chop ice and knead dough with the best of them. A big inner cooling fan so that it never runs hot, and that makes for durability. Made in America quality that can’t be beat. Comes with a very good recipe booklet. This is a very expensive blender. Lesser blenders at one-third of the price are capable of getting close to what a Vitamix does if you’re OK with tending to the process a bit more and don’t mind a bit of graininess in your smoothie. To make power it uses 12 amps. Make sure this unit gets plugged into its own separate outlet or you will be blowing breakers if any other appliance is turned on. Make no mistake about it, the Vitamix 780 is an exceptionally fine blender. It will work just as well on your kitchen counter as it will residing on your home bar, and for grinding ice or making vegetable smoothies, there are few that can do it better. Although this is considered one of the best of the best blenders available, featuring built in the U.S. quality and durability, for most homes this can be serious excess if you only use it for blending jobs. If you’re going to use this as an all in one blender and food processor, then go for it. Otherwise get one of these combo appliances. The question truly becomes whether you need this or just want this. If you are seriously into chopping or grinding up ice for smoothies, love to make home-made nut butters and pizza and/or bread dough in a blender instead of a food processor, then this unit is certainly something to consider. Doughs are a bit more labor intensive in a blender than a mixer, but they can be done relatively easy and effectively in the Vitamix 780. However, if you are making smoothies with little or no ice or more hard to process vegetables, if you are blending bar drinks, making shakes or malts, or using a blender primarily to mix liquids, you may want to consider a lesser priced blender that will do the job just fine. We have reviewed some of the best here.